As the prep football season fast approaches, I thought it might be good to take a look at some of the players sure to do great things the coming season. One of those is senior wide receiver Geordon Porter of Etiwanda. Porter currently has 15 offers and has narrowed his list to seven schools. He has planned visits to Utah (Sept. 2), Notre Dame (Sept. 9) and Arizona State (Sept. 16). Four other schools – Alabama, Cal, Colorado and UCLA – are still in play. He had quite the smorgasbord to chose from. 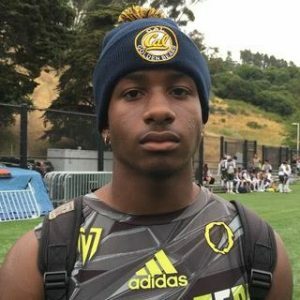 Others offering included Purdue, UNLV, Washington State, Hawaii, Georgia, San Jose State, Colorado State, UNLV and Duke. The 6-foot-2, 172-pounder had a decent season as a junior with 33 catches for 512 yards and five touchdowns. He came up big in a 45-42 win the last game of the regular season against Damien which got his team into the playoffs. Etiwanda coach Kevin Davis said interest in his speedster picked up in the spring after he ran 10.6 in the 100 during a spring track meet. A couple of offers quickly turned into more than a dozen. Porter’s potential is not surprising given his genes. Father George was a track standout at USC. Older brother Grant, who graduated from Upland in 2016, red-shirted last year at Washington State and is looking to be a factor for the Cougars this year at defensive back. Porter says he learned a lot from watching his brother go through the recruiting process. Davis said while Porter’s biggest contributions will come on offense, he night also be used on defense as well as on special teams. “He makes things happen so we definitely have to get the ball in his hands,” Davis said. Porter and the Eagles make their debut on Aug. 25 against Summit in their annual rivalry game at Miller high School. through the process. Father Anders Anderson was the girls basketball coach at Etiwanda and he had many players from that program move on to the next level. The 6-foot-5, 280-pound offensive tackle recently committed to Washington State, picking that school from among 10 offers. He and his father visited Washington State, Arizona State and Oregon State. Anderson said he got a chance to speak with a lot of players who had nothing but good things to say about their experiences. Anderson plans to major in criminal justice. In addition to the schools he visited, offers came from Utah, Colorado State, Colorado, UNLV, New Mexico, Hawaii and San Jose State. Oldest sister Ashtyn played basketball at NCAA Division II Chico State before her career was derailed by multiple knee injuries. Another sister Alyssa is entering her junior year at UNLV where she too plays basketball. Brother Aidan will be sophomore at the University of Regina (Canada) where he played football. Anderson has worked hard in preparation for his senior season, adding 60 or so pounds to his 6-5 frame. He and his Eagle teammates open the season on Aug. 25 with the rivalry game against Summit at Miller High School. Etiwanda football standout Nate Neal has made a verbal commitment to UNLV. He visited the school in December and liked everything it had to offer, not just when it came to the football program but in academics as well. He plans to major in criminal justice. Neal, a 6-foot-3 defensive end and tight end, didn’t make any other visits although San Jose State, Montana State and Sacramento State were interested. Neal had made a couple of trips to Washington in an informal capacity to visit brother Michael who is part of the Huskies program although missed this season due to injury. Neal recorded 47 tackles, 11 of those for loss this season for the Eagles. He also had seven sacks and a forced fumble. 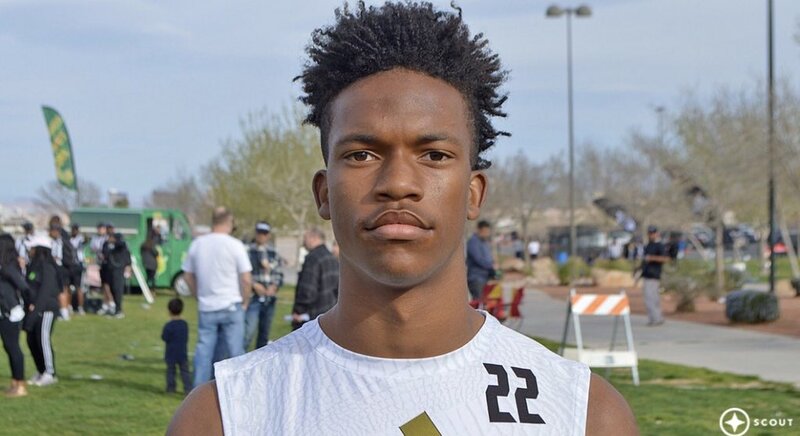 Etiwanda High School’s Andre Grayson hasn’t visited Utah State just yet but he has had such good conversations with members of the coaching staff and developed such a rapport that he has committed to that school any way. 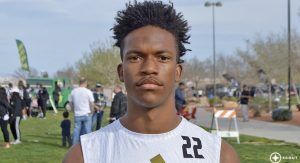 The 5-foot-9, 155-pound defensive back was also being recruited by San Jose State, New Mexico and Air Force, among others, but he never made an official visit. Grayson recorded 48 total tackles with four interceptions, six passes defended, a forced fumble and one fumble recovery. He started his high school career at Rancho Cucamonga but transferred to Etiwanda the second semester of his freshman year. He started four games for the Eagles as a sophomore. He was a second-team All-Baseline League selection the past season, helping the Eagles to a post-season berth and first round upset win over Valencia. It hasn’t been the greatest of seasons for the Etiwanda Eagles, which makes their performance against Damien tonight even more noteworthy. Coach Kevin Davis’ team went into the game with a 3-6 record and 1-3 in the Baseline League. Damien went in a stellar 6-3 and was really the only team that put up much of a fight against mighty Rancho Cucamonga. Davis was still convinced that a win over Damien would get his team into the playoffs and harped on that all week to his team. A win would mean the teams tied in the league standings but Etiwanda would have the head-to-head. Well it wasn’t looking so good for Etiwanda which trailed 42-16 going into the fourth quarter. It wasn’t until several minutes later that the rally even started. Davis said his team recovered two onside kicks and jumped on a Damien fumble which helped keep the ball rolling. He credited running back Kasmir Dina and quarterback Tommy McDonnell for igniting the rally. Dina has seen a lot of playing time in place of the injured Lawrence Starks who has been out with a high ankle sprain. McDonnell has been the starter much of the year but was on in relief of Justin Hamel. The comeback was complete with a 7-yard slant pass from McDonnell to Geordon Porter with under a minute left. The teams are both in Division 4 which means Etiwanda would likely have to be taken ahead of Damien despite the worse overall record and Davis said there are other teams with worse records than his. Davis is the head coach but he also serves as the offensive coordinator. He decided to call the game from the press box which he has always done as an offensive coordinator but never as the head coach. “I just thought I needed to do that to give us the best chance to win,” he said. We’ll have to wait until Sunday to see just how that outcome affects the playoff draw. But it sure has sent a buzz through the Inland Valley tonight. Etiwanda was 3-7 last year in the first year of the Davis tenure. It was still looking for a signature win. Well it is looking no longer. Etiwanda junior quarterback Tommy McDonnell sustained a concussion late in the first half of Friday’s 22-14 loss to Summit and will have to miss this week’s game against Redlands East Valley because of concussion protocol. The starting nod will go to Justin Hamel, also a junior. The Eagles are not in panic mode however. McDonnell and Hamel battled for the starting spot, sharing the reps in the spring and summer. So Hamel is prepared to step in. Etiwanda coach Kevin Davis said it is unlike last year when he lost his starter to a concussion, then had to scramble because the second option was a distant second best at that position. The Etiwanda football team was in transition last under first year head coach Kevin Davis and the Eagles dealt with the expecting growing pains in finishing 3-7. Well the Eagles graduated 29 players so they’re still going to be a team in transition. Making matters a little more difficult, Etiwanda opens its season on Friday against a Summit team that went 10-0 in the regular season a year ago. Davis said the bright spot so far, although there has yet to be a snap in the regular season, has been the running back core led by junior Lawrence Starks who saw playing time last year as a sophomore on varsity. Others who will contribute there include junior A.J. Williams and senior Kasmir Dina, neither of whom played last season. The quarterback nod has gone to junior Tommy McDonnell, who won a tough competition with senior Justin Hamel, with whom he split time on the junior varsity last season. The group looking to pave the way for those athletes is led by senior left tackle Chris Bradberry, junior right tackle Alec Anderson and senior right guard Ryan Hanson. The receiving core is led by senior Evan Gutierrez. Davis also got a transfer in Geordan Porter, who came over from Upland and is younger brother for Upland graduate Grant Porter. The Eagles inexperience shows up more on defense where the long players with any experience are senior defensive end Nate Neal, senior lineman Kyle Edwards and junior corner Andre Grayson. Davis is also high on newcomers senior linebacker Connor Sweeney and senior defensive back L.J. Bailey, both up from the junior varsity. Etiwanda High School quarterback Andrew Kanatsky has signed with NCAA Division II Malone University (Canton, Ohio). He visited the school six or so weeks ago and liked what he saw in the small, private school with an enrollment of about 3,000. The Pioneers play at Hall of Fame Stadium adjacent to the NFL Football Hall of Fame. Malone offered early but Kanatsky didn’t think it was quite enough of an offer to be able to make the move across the country. He was sold on a going to a community college but then Malone bettered the offer making the school more affordable. He said the Pioneers have two quarterbacks but one is a senior and the school is bringing in three so he hopes to compete for playing time right away. “They told me there will be open competition for the job so I’m excited about the chance,” he said. Kanatsky threw for 2,056 yards (228.2 avg) with 20 touchdowns and 7 interceptions. He was a first-team All-Baseline League selection. The Pioneers went 0-10 last year but compete in a strong conference in the Great Lakes Intercollegiate Conference. 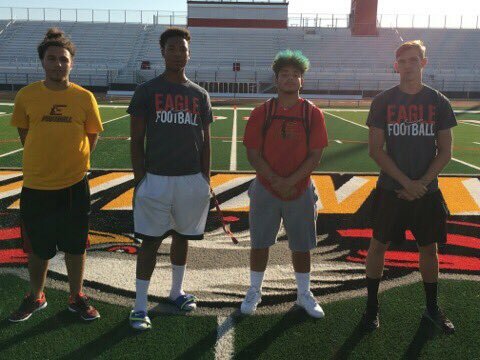 Etiwanda football players Treyjohn Butler (Stanford), Billy Carter (Arizona Christian), Kendall Greer (Northern Arizona) and Kamari Pleasant (Washington).